Welcome! The Climate Change Symposium is open to the entire campus community and the public and has previously drawn large audiences interested in climate and energy issues. The 2016 focus on Water-Energy-Climate interconnections will appeal to a larger audience, as it tackles a number of pressing issues of high interest to the public: How can we continue to meet our essential water and energy needs? How can we ensure safe and reliable resource provision to cities while protecting residents from adverse impacts, such as flooding? How can we simultaneously increase the efficiency and resilience of energy and water use? How can local communities and governments best work together to solve these challenges? 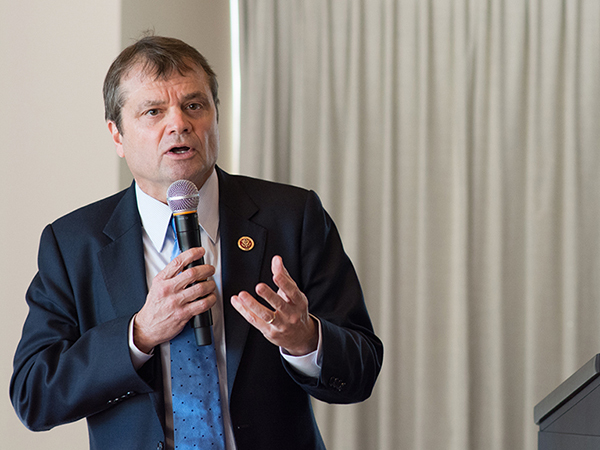 Watch U.S. Representative Mike Quigley (D-Ill.) deliver the Keynote Address at the 2016 Northwestern Climate Symposium.